In a sombre address to the UN yesterday, the Dalai Lama called on the international community to recognise that bumper sticker-based diplomacy had failed his country. While praising the efforts of Kombi drivers and cyclists for their dedicated support, the spiritual leader’s central message was one of disappointment. Despite claims, bumper stickers had neither “raised awareness” nor caused people to “get involved”. When asked about the Dalai Llama’s speech, Chinese government sources said that they were unaware of any sticker campaign, and denied persecuting Tibetans, unless they were members of Falun Gung. 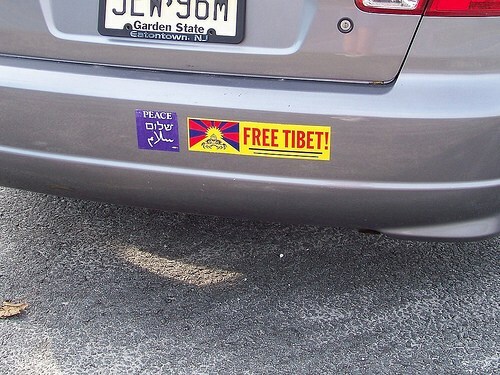 Analysts say Tibet is only the latest in a long line of issues failed by bumper stickers. The concerted “NO HOWARD” drive, for example, failed in both of its stated objectives. Tibetan nationalist groups, however, are unconvinced, and say that the program’s failure will force them to turn to more militant forms of resistance. Pocket groups of celebrity fundraiser organisers are ready to be deployed, and there are claims that Martin Scorsese has already commenced work on a sequel to his 1997 flop Kundun. Some extremists have warned of possible attacks of Richard Gere’s incoherent moralising. Former bumper sticker activists have agreed to support the new strategies, but have cautioned Tibetan groups that if their van’s a-rockin’, not to come a knockin’.